Abstract: The increase of international freight commerce is creating pressure on the existing transport network. Cooperation between the different transport parties (e.g., terminal managers, forwarders and transport providers) is required to increase the network throughput using the same infrastructure. The intermodal hubs are locations where cargo is stored and can switch transport modality while approaching the final destination. Decisions regarding cargo assignment are based on cargo properties. Cargo properties can be fixed (e.g., destination, volume, weight) or time varying (remaining time until due time or goods expiration date). The intermodal hub manager, with access to certain cargo information, can promote cooperation with and among different transport providers that pick up and deliver cargo at the hub. 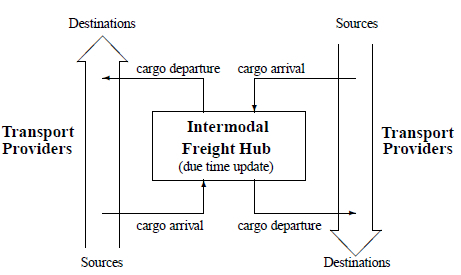 In this paper, cargo evolution at intermodal hubs is modeled based on a mass balance, taking into account hub cargo inflows and outflows, plus an update of the remaining time until cargo due time. Using this model, written in a state-space representation, we propose a model predictive approach to address the Modal Split Aware � Cargo Assignment Problem (MSA�CAP). The MSA�CAP concerns the cargo assignment to the available transport capacity such that the final destination can be reached on time while taking into consideration the transport modality used. The model predictive approach can anticipate cargo peaks at the hub and assigns cargo in advance, following a push of cargo towards the final destination approach. Through the addition of a modal split constraint it is possible to guide the daily cargo assignment to achieve a transport modal split target over a defined period of time. Numerical experiments illustrate the validity of these statements. Reference: J.L. Nabais, R.R. Negenborn, R. Carmona-Benitez, M.A. Botto. Achieving transport modal split targets at intermodal freight hubs using a model predictive approach. Transportation Research Part C, vol. 60, pp. 278-297, 2015.